"The Scientist and the Mystic Within" is the first essay I posted in the "The Reading Room." I had several goals in mind. I wanted to express my respect for science. Many religious dogmas, for example, are viewed as unassailable while science is always open to criticism and improvements. I question the validity of any truth that supposedly shouldn't be questioned. I also wanted to give an overview account of particle physics since it is the partner to cosmology, the study of the large scale structure, origins and possible end-scenarios of our universe. I wanted to also introduce readers to the search for the so-called "Theory of Everything:" (TOE) and to give a cursory account of some of the current contender theories including my own contribution "Vibe Theory." In all of this there's the need to explain in lay-person's language the Standard Model of Elementary Particle Physics. It is a wonderful theory that lays out how micro-realm particles operate. The particles in the theory are currently thought to be elementary. This means they haven't found to be made of tinier elements. However, there are still missing blanks in the theory and it might be that we haven't yet hit the bedrock level. If this is so, then there must be a yet-to-be-discovered tinier group of particles that make up the Standard Model particles. Finally I cite some other unique indicators that may also mean our theories in physics are incomplete. I wonder what constitutes life, consciousness, emotion, intuition, and thought. This is a realm that physicists have yet to explore. Yet these things must also be part of any complete theory. Academic writing contains information references that are marked (usually) by numbers in the text. These text numbers are references to a source linked by the same number but is elsewhere in the essay. Sometimes it is a footnote at the bottom of a page and other times its an endnote at the end of a document. In this essay I use endnotes. If you want to view the reference before you get to the end of the essay you can click on an endnote text number e.g. . It will take you to the endnote. Sometimes the endnote is a URL and clicking on it will take you to an outside Internet source or Web page. Read it and then click "the back <== key" . You can also click on the icon & file name on the strip on your screen to come back. After you have viewed the endnote you can also click on the endnote reference number e.g. and it will move the cursor to the area where you started in the text. 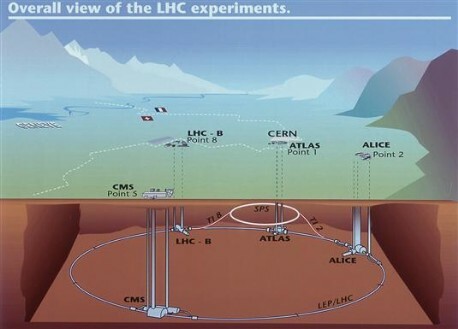 This is an aerial view of the new Large Hadron Collider (LHC) near Geneva; it straddles the Swiss/French border. The circular tunnel is about 27 kilometers around and this is where hadrons i.e. 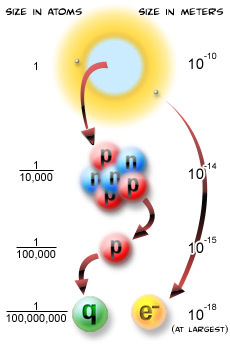 protons will be collided at velocities close to the speed of light. Of course the real collider tunnel (depicted in yellow) is actually buried 50 to 175 meters underground. Scientists have great hopes for what might be discovered about micro-realm particles and interactions. See the image of the LHC Four Experiments in the main body text. Photo courtesy of the Department of Rare Books and Special Collections, Princeton University Library. In 1921, Dean Henry Burchard Fine of Princeton University went to New York to pick up Albert Einstein who had chosen Princeton for a lecture series on his new theory of relativity. Scientists all over the United States packed the lecture hall for five talks. 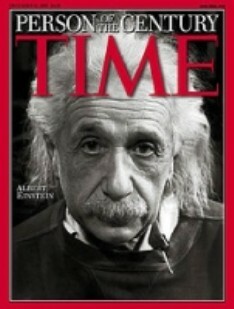 Einstein decided to settle down in Princeton in 1933. He died there in 1955. "Everyone who is seriously involved in the pursuit of science becomes convinced that some spirit is manifest in the laws of the universe, one that is vastly superior to that of man." "Quantum mechanics is certainly imposing. But an inner voice tells me that it is not yet the real thing. The theory says a lot, but does not really bring us closer to the secret of the 'Old One.' I, at any rate, am convinced that He is not playing at dice." He was a major contributor to the development of quantum mechanics. He is noted for, amongst other things, for formulating the first formal interpretation of the new science, known as the Copenhagen Interpretation. He held strongly to its precepts during his seminal debates with Albert Eintstein. "Every sentence I utter must be understood not as an affirmation but as a question." CREDIT: AIP Meggers Gallery of Nobel Laureates. Heisenberg was another key founder of quantum mechanics. He worked closely for a time with Bhor and together made many breakthroughs. He is particularly known for formulating what is called "The Heisenberg Uncertainty Principle" but also for his mathematical formulation of quantum mechanics. Paul Dirac is probably the second most famous English physicist i.e. Isaac Newton being the first. He is known for his mathematical formulation of quantum mechanics. One of his works was first to predict an anti-mater counterpart to the electron, the positron. He was also able to reconcile special relativity and quantum mechanics as it applies to the electron; a ground breaking work in its time. It also implies that the vacuum or empty space is buzzing with virtual pairs of electrons/positrons. The concept was later expanded on by others and virtual particles of different types are now known to be essential for the operation of different forces and interactions. Image of the four forces or interactions. The top two are long- or infinite-ranged forces while the bottom two are short-ranged and operate within atomic nuclei. The generations of particles differ in mass. Notice the quark generations consist of pairs but each quark has a different mass. The first generation of quarks, for example, are called the "up" & "down" quarks. The down quark is slightly more massive than the up quark. Second generation pairs are the "charm" & "strange" and the third are the "top" & "bottom." The top quark is the most massive know fundamental particle. The second generation electron is called a "muon" and the third is called a "tau." A first generation neutrino is called an "electron neutrino," second generation is called a "muon neutrino," and the third is called a "tau neutrino." In the everyday world we only see things made up of first generation fermions i.e. up & down quarks and electrons. Up & down quarks combine to form things such as protons and neutrons. Higher generation particles usually appear in high energy processes and tend to quickly decay into lower generation particles. This is the content of the Universe (Today & 13.7 billion years ago) extrapolated from the WMAP satellite data. I love science. It's one of humanity's greatest achievements. It is based on reason/logic, observation/detection & experiment/repeatability. It requires that theories make predictions that can be tested and confirmed or falsified. All together these elements make it stand out as our most objective probe into the nature of things. Much good work has been done. The tiny, atomic and subatomic realm is best understood via quantum mechanics. Its chief theory is called the "Standard Model of Elementary Particle Physics." It tells us of the fundamental or elementary particles that make up mater and three major forces: strong and weak nuclear forces and the electromagnetic force. These particles are thought of as forming the bedrock of things; which is to say they have not been found to be composites or made of even tinier things. So far there hasn't been a firm detection that proves a tinier particle realm exists. The electron, for example, carries a positive electrical charge while its anti-particle counterpart, called the positron, carries a positive charge. Anti-particles are short-lived since when they interact with or contact their opposites both annihilate in burst of high energy radiation. Luckily our world is dominated by mater particles and anti-mater particles only arise in tiny isolated amounts in high energy particle interactions. These do not normally even combine to form even the simplest anti-atom. It is sometimes suggested that anti-mater galaxies might exist somewhere in our universe. These should emit the same kind of light as mater galaxies so we can't tell from regular telescopic studies. However, if they exist and one collided with a mater galaxy the resulting gamma ray burst would be stupendous. We have observed colliding galaxies but have never seen anything like that. The Standard Model is very successful as it explains much of the physics related to the micro-realm. Unfortunately there are three problems related to mass that it doesn't explain. The first and perhaps major one is we don’t how particles get their mass and yet all the particles have mass except the photon. Even the neutrino has been shown to have a tiny mass. A lot of research has been done and continues at particle accelerators in search of a boson termed "the Higgs" or "Higgs boson." It is a theoretical particle that is believed by many physicists to be the active agent that gives the Standard Model particles their mass. (Models appeal to several different Higgs bosons so it isn’t just a search for one particle). It might turn out the Higgs doesn't exist and nature uses some other mechanism to give particles mass. The second problem is called the hierarchy problem. Simply put the question is: why is gravity so much weaker than the other three known particle physics forces i.e. the strong and weak nuclear forces and the electromagnetic force? The weakest of the three is the weak nuclear force. Gravity compared to the electromagnetic force, which is the other long ranged force is about 40 powers of 10 i.e. 1040 weaker! It is unknown why there should be such a wide range or hierarchy in the energy of the forces. We also see another wide spread amongst the masses of mater building particles. The range goes from the lightest which is the neutrino, then the electron and finally the quarks. The top quark is the most massive fundamental particle. The third problem is called the hierarchy of flavors problem. So far we have detected three different flavors or generations of fermions that differ in mass. This is to say there are three different electrons and each with a different weight/mass; ditto for neutrinos. Quarks come in three different flavor pairs; i.e. six quarks all together. The lowest generation of all three fermion types is common in most interactions but it is unknown why the other two exist. It is hoped that some of these problems will be solved after the Large Hadron Collider (LHC) near Geneva, Switzerland is restarted. This is scheduled in later 2009. The machine has already had a short first run in 2008 but it was shut down due to technical difficulties. The LHC has been dubbed "the Big Bang machine" and when it slowly reaches its maximum power it will become the most powerful particle collider in the world. Gravity is the fourth known major force but it isn't included in the Standard Model of Particle Physics. This is because all quantum forces must have a boson and physicists have yet to detect the so-called "graviton." In other words, we haven't determined how the force originates in the subatomic or micro-realm. Normally this isn't a problem as far as most calculations go since gravity is by far the weakest force and its role is negligible in sutomic particle interactions. For one thing the mass of these particles is very tiny and gravity only starts to really count at the Planck mass which is about as massive as a grain of sand. This sounds tiny but it is many orders of magnitude higher than even the top quark. However under very unusual situations such as in very high energy/temperature conditions or when two particles become uncommonly close together gravity becomes more affective in the micro-realm. In our everyday world gravity is dominant since our planet is a bundle of a huge amount of mater. Gravity also keeps the planets in orbit around the Sun etc. Its action in the macro-realm is best described by the other great theory in physics, "general relativity." If we discover how the two great theories i.e. quantum mechanics and general relativity inter-relate then we would have a quantum theory of gravity. 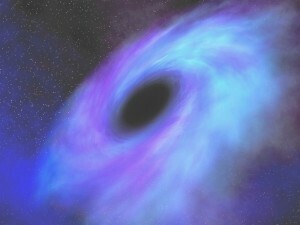 As we will see shortly, quantum mechanics is a very strange theory and so it isn't surprising that attempts to directly connect it with general relativity haven't been successful. Smolin's first problem, which I just previewed, is the problem of quantum gravity. It must succeed in including gravity into the micro-realm picture. However it is possible to have a stand alone theory of quantum gravity that isn't a TOE; the theory called loop quantum gravity is an example. The difference is that the TOE must reach further and solve several other problems. Superstring theory is positioned as a TOE contender. The second problem for the TOE is how can we make sense out of the mysteries of quantum mechanics? It's a very unique theory that includes many bizarre things that we don't experience in our everyday world. In 1900 physicist Max Planck discovered that energy is not infinitely divisible. It only comes in lumps and there is a smallest possible amount that can be detected and/or exchanged called the quantum. This was the initial discovery that others built on to develop the new science. In quantum mechanics probability and uncertainty replace the roles that causality and certainty plays in the older or classical theories. Strangely particles in quantum mechanics can also behave as waves. This is called a quantum or conjugate duality and there are others. What we detect depends directly on the structure of experiments or detection systems. We can't detect something that is a particle and wave at the same time yet at different times these things display either nature. It is as if what we detect depends on the type of "looking glass" we use. There is also the position/momentum duality and it is considered a core mystery. If we want to know the position and velocity of a macro-realm object, let's say an automobile, it isn't a problem. However if we want to know the precise position of a subatomic particle we can't at the same time know its velocity and vice versa. This isn't a limitation of our detection technology but is rather a physical limitation. The value of the restriction was firstly worked out by the theoretical physicist Werner Heisenberg. It is now called the Heisenberg Uncertainty Principle and it puts it all into a precise mathematical formula. It is as if quantum particles don’t have precise positions and momentum at the same time. There is also an energy/time duality where trying to measure either one on a subatomic particle also limits the accuracy of its partnered or conjugate variable. To add to the confusion we also know that some particles can apparently interact instantly even when separated by great distances i.e. quantum entanglement. This appears to violate Special Relativity that dictates that information cannot be transmitted faster than the speed of light. There are also other particles that appear to tunnel through seemingly "impossible" energy barriers i.e. quantum tunneling. This is somewhat akin to you or me walking through a solid wall. Still quantum mechanics is an incredibly successful science. Without it we wouldn't understand things like nuclear fusion & fission, lasers, microwaves, radioactivity, electronics and much more. You might wonder how probabilistic things can be accurate. The answer is when you make statistical predictions based on large populations of things, such as subatomic particles, the outcomes become predictable. The result was that the quantum mechanical equations made possible the development of most of the modern world's technologies, including computers. The reality is it works; but it is difficult or perhaps impossible to understand on the bedrock level. Some physicists think there is something missing in the micro-realm picture; which is to say quantum mechanics is an incomplete theory. They believe that when the missing link or theory is discovered the fog will lift and things will make sense. This position was championed by Albert Einstein. Other physicists insist quantum mechanics is a complete theory. They claim nature in the micro-realm only seems bizarre when we attempt to impress our everyday reality on it. Niels Bhor, one of the founders of quantum mechanics, held this position. The controversy ensued almost at the inception of the theory. Einstein and Bhor had several fiendly debates at intervals beginning in 1927 up and into 1935. It appears subsequent experiments has decided the issue in Bhor's favor but the question persists: how can we make sense out of quantum mechanics? Smolin claims either one must make sense of it as it is or develop a new theory that does. The third problem relates to the discovery of a suspected unifying common link among the Standard Model particles. There has been a theoretical attempt at increasing the unity among particle classes. The idea is there is an underlying symmetry among fermions and bosons. Common coins, for example, have a heads & a tails sides. Each is a different side of the same coin and hence shares its symmetry. A theory called super-symmetry assumes each fermion has a related boson and vice-versa. The theory introduces a hidden partner particle for each known particle. This theoretically doubles the number of Standard Model particles but these hidden partners have yet to be detected. In any case super-symmetry did remove some mathematical difficulties caused by infinite values popping up in equations but it isn't known whether the theory describes a route that nature actually took. Early string theory was developed as an attempt to explain the strong nuclear force. This didn’t work out and was superseded by a new “colors-like” theory of the strong force, now called quantum chromo-dynamics. String theorists latched onto super-symmetry and used the extra particles to develop a theory of quantum gravity. This is why string theory is now known as “superstring” theory. However the search for Smolin's common link goes even deeper for an even more far reaching unity. Perhaps there is an undetected common particle that interacts and creates Standard Model particles. Many theorists still think that superstring theory might be the key to this mystery. The main idea is that particles rather than being point-like things are the result of vibrating strings. The vibrations are like music but make up the different particles depending on how they vibrate. It's dissapointing that after over 20 years of additional theoretical modeling superstring theory is still not much closer to solving the problems. The challenge stands: we must determine whether there is a unifying fundamental entity that manifests the Standard Model particles. The fourth problem could be called the problem of the constants. The speed of light is the most commonly known constant but there are some 20 constants that are used in the Standard Model. These are the values of forces and masses that largely govern particle interactions. This isn't simply a side issue. If the constants didn't have the values they do (or very, very close to them) it could have jeopardized the early formation of atoms and molecules. Larger things, like galaxies, also require the gravitational constant to be as it is or these things could not have formed. It's easy to see how the constants issue is directly related to the appearance and evolution of life. A large number of atoms and molecules are needed to form stars and planets (with special qualities) in order to create a stable base for life to evolve. The key need for specific life supporting values of constants is expressed as the "Anthropic Principle." Some physicists such as Leonard Susskind think it is explanatory like the Principle of Relativity. Others such as Lee Smolin claim it is merely descriptive and hardly even sound science. The debate continues. The interpretations include both weak and strong versions of the principle. The weak version claims that if the constants are inline then advanced life has a probability to arise. The strong version insists given the right values, life must arise. It is clear the apparent design around us largely stems from the fine-tuned values of the constants. It all looks very much like a put-up-job that religious people interpret as the special creation of a god or gods. Scientists seek for natural explanations and have used the Anthropic Principle in link with the multiverse idea. It basically says we live in a universe that is part of a collective of others, hence a "multiverse." All of the member universes aren't assumed to have constants that support or allow for the appearance and the evolution of life. Only a small set of universes would have advanced life due to the luck of the draw termed “anthropic selection.” This places the appearance of advanced life into the realm of a multiverse form of probability and waters down the apparent fine-tuning of the constants. The design of complex life therefore appears to be less of a deliberate manipulation and more like a chance event. In any case, the key question remains: how are constants determined by nature? So far their values are measured in experiments; then physicists "pencil" these values into their equations. It's a little bit like fixing holes in a damn by simply measuring them and making up plugs or patches that fit. If the damn shifts and new cracks appear around the patches you simply add more filling. Ideally we should be able to derive these values directly from first principles. The need to measure and input their values means something very key is missing in our theories. Any successful TOE should eliminate the need to fill in holes in the damn of particle physics. Smolin's fifth problem is really a grouping of two cosmological mysteries. It is: what is the nature of the mysterious dark mater and dark energy? There must be some missing mass that isn't apparent in the visible stars within galaxies that is causing outer galactic stars to move faster than can be accounted for. It also causes galaxies and clusters of galaxies to stay bonded together. This has been dubbed "dark mater." Whatever it is, it's probably something outside the Standard Model and yet dominates the gravity producing elements in our universe. Dark energy is also invisible. Beginning about five billion years ago something has been causing the expansion of the universe to accelerate and we also don't know what it is. It turns out that dark energy is currently the dominant energy and dark mater is the second on the list of what composes of our universe. NASA's WMAP scientists claim that today: dark energy makes up 72% of the universe, dark mater about 23% and common or baryonic mater only about 4.6%. This embarrassing breakdown implies we don't really understand the makeup of 95% of our universe. The TOE will have to determine what these dark entities are. Keep in mind there are also other problems or mysteries of equal importance to Smolin's five that the TOE must solve but I will not go into these here. The previously mentioned superstring theory and the theory of loop quantum gravity have at least partial answers to one or more of the five major problems. I've written much on the search for the TOE and developed a TOE contender called "vibe theory." It is the only theory I know of that can solve all of the above and many other key problems. I will not give a complete account of vibe theory in this essay but I will hit on some of its general elements. Even when the TOE is finally determined at least one general question will remain: can we explain everything by the dance of micro-realm particles? In other words is everything in the universe "physical" as understood by Standard Model particles? I initially thought that natural law was information that somehow controlled the action of known particles. If so, it would be non-physical. I have since explained natural law by a theory of the universe's initial conditions. It is part of "vibe theory." It claims there are three fundamental sub-quantum strings called preons that have force qualities. They interact and makeup space/time, matter and the major forces. Hence an ethereally acting natural law isn't required. I also once thought that time was non-physical but several theories create a physical picture of how space and time are interconnected. Vibe theory explains that "space/time" consists of a lattice of interlocked units. This is similar to the view used in Loop Quantum Gravity that depicts loops of space/time; both theories create a discrete space/time. However vibe theory differs in that each unit of space/time is a composite, consisting of three interlocked preons/strings. You can think of these units as the "atoms of space/time" since atoms are also composites but of course they aren't literally atoms. At the genesis of our universe there was a massive influx of the units of space/time. It created the lattice but the "Big Vibe" caused some units of space/time to pop. This allowed some preons to free flow and mix through out the space/time lattice. Some of these freed preons interacted and created mater (fermions) and the forces (bosons). The theory goes on to explain how even today preons interactions create local paces that we think of as "time." This adds to and dovetails with what Einstein showed. He claimed time isn't universally the same as it locally flexes depending on the strength of gravity and/or on the velocity of moving things. Your watch or clock is merely a scale device that indicates the pace of events in your immediate locality. Moreover the varying paces occur within "space/time" and this connection negates any strictly stand alone concept of time within our universe. However, there is a theoretical caveat in the discussion of time that stems from pre-universe scenarios related to scientific genesis theories. In these theories time in some sense is depicted as pre-existing our space/time continuum. To understand this we have to start with a short discussion on scientific theories of the genesis or beginning of our universe.. There is a lot of evidence that points to the conclusion that our universe had a beginning. 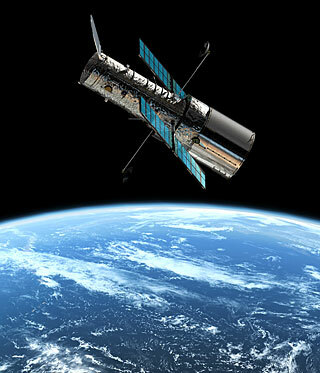 In the 1930's Edwin Hubble's telescopic observations proved the universe was expanding. After the early cosmologist Georges Lemaitre learned of it he took it to its logical conclusion. He realized the early universe was much smaller and claimed it must have started as a primeval "atom" that exploded. This was soon dubbed "the Big Bang" ironically as an off-the-cuff slight by physicist Fred Hoyle. He championed the then opposing "Steady State" theory. It stated the universe was infinite i.e. it didn't have a beginning and was always in a steady state in terms of its content. One problem is he and his associates had to hypothesize the constant creation of tiny amounts of hydrogen to keep up the same material content or density in an expanding universe. The accumulating evidence has been convincingly in Lemaitre's favor while none of Hoyle's steady state predictions have been verified. One line of evidence that supports a beginning lies in the abundance of light elements such as hydrogen, helium & lithium in our universe. Their detected quantities essentially agree with that predicted in models of early nucleosynthesis that deal with the details of when atomic nuclei initially formed. The first two fit very firmly in the predictions but more recently there have been some questions raised about lithium. It appears there is too much of one of its forms and not enough of another. In any case hydrogen is the most abundant element and the early models indicate it and most of the helium and lithium had to have been created in the early universe before stars formed. Hydrogen is the only light element that isn't produced in stars and it is the primary stellar fuel. This means it had to have pre-existed the first stars. This alone implies our universe had a beginning. There have also been fruitful detections of light or photons. We have even detected the first free flowing photons in what is called the cosmic microwave background (CMB) via NASA's WMAP satellite and other experiments. These photons took their first flight when they decoupled from the other swirling particles in the primal cloud. We also observe the most energetic galaxies called quasars but their light reaches us from great distances. In astronomy observations of the light emitted by distant objects is connected to past times. When we see the sun shining, its light took about 8 minutes to reach our eyes. This means the picture we see of the sun is 8 minutes old. In the case of quasars we look to spectral studies of light to determine their distance. Isaac Newton discovered when light is passed through a prism it breaks out into different bands of colored light. The light from heated elements creates unique spectral signatures and we have cataloged them from experiments on Earth. The good news is we can use the data to tell the composition of distant stars. There are hot elements that not only emit light but also absorb some specific wave-lengths. The colored bands of their spectrums are thereby also marked by dark absorption lines. There isn't any such thing as an absolutely stationary star or galaxy as everything moves relative to other things. There are some galaxies that are moving towards each other but most are in clusters that are moving apart due to universal expansion. The constant expansion causes the light emitted from a source; let's say a star, to stretch. This means the wave-length of light increases or shifts towards the red end of the spectrum of light. The great thing is the stretching also causes the dark lines in spectral signatures to shift towards the red-end of the light's spectrum. The further away a receding source is, the faster it is moving and the greater is the red shift. These light signatures tell us that quasars are billions of light years away from us. It means quasar galaxies are relics of a very different past. It points to different earlier conditions and also to a genesis. Here are some sample galaxy spectra i.e. light emitted by distant galaxies illustrating different redshifts or stretching of specific wavelengths of light. Notice the red arrows. The larger ones illustrate greater red shifting and are therefore further away from us. There is also the possibility of studying a neutrino background radiation since neutrinos are also predicted to have been abundant in the early universe. This would be challenging since they are very difficult to detect. It is said that neutrinos can even zip through a block of solid lead several miles long and interact with very few particles. This is due to the fact that they not only move at close to the speed of light but only interact with gravity and the weak nuclear force. Millions of these particles, most originate in our sun, are harmlessly passing through your body even as you read this. These are difficult entities to spy on but we've managed to do so in specialized underground experiments. Another promising source might come from the study of gravitational waves. Since scientific genesis theories make specific predictions about the energy and propagation of early gravitational waves it could prove to be decisive. Gravity interacts with everything and so gravitational waves cannot be blocked by dust or other kinds of mater. This means they could be a rich mine of new information. There are several gravitational wave detector experiments underway and others are planned but unfortunately they haven't yet been detected. It would be cool if they succeed since some of these waves could stem from the earliest times. Perhaps there still are things which are non-physical, but it may depend on answers to other questions. What is life? How did it begin? What are: consciousness, personality, awareness, thought, intuition and emotion? You might think some of this is in the realm of psychology and not physics but the two fields must overlap. Here is what I mean. If our universe started from a Big Bang or Big Vibe etc. then everything that is here must in theory be traceable back to the genesis. We know that mater is made of atoms and molecules and these consist of Standard Model particles and these are in principle traceable to the beginning. Yet thoughts, for example, also exist but what do they consist of? We can say it's all brain function but here we encounter many blanks or areas of missing information. It is often assumed a human being is merely "a ghost in the machine" and once the body dies our minds simply cease. This is the medical/scientific perspective but we still don't have a complete model of how the brain works. We know the brain is composed of billions of cells that include chemical and electrical activity. We have also identified parts and areas that specialize in functions. If scientists could demonstrate how the brain creates consciousness etc. it would certainly strengthen the argument. There are analogies from how some of our technology works to brain functioning. We know for example moving pictures on television result from photon emissions from cells in the screen. A television is a complex light machine but it takes a human mind to decipher and interpret the light as a moving picture. We also understand how computers work in processing data and it is widely thought to be similar to brain function. These technologies are driven by electricity and electrons also move around the billions of brain cells via nerve pathways. We use electromagnetic waves within the "radio wave" frequencies to can carry information such as what we transmit and receive in radio and television receptors. These kinds of electromagnetic waves are modulated so the information e.g. sound, music, pictures etc. change the shape of the carrier wave. The carrier waves have large wave lengths and can't travel and carry information between the cells inside our brains. Notice the image. The wavelengths of radio waves are the largest. Brains cannot and do not generate the shorter wavelength x- or gamma rays since these are too energetic and incidentally can destroy brain tissue. It's also difficult to imagine how electrons, which do reside in brains and are responsible for its moving electrical currents, could be interacting and creating thoughts, emotions, intuitions, consciousness and personality. Yet the "I AM's" that are you and I exist. Maybe our brains use some currently unknown wave/particles that are outside the Standard Model. These would have to be low energy and/or weakly interactive and have a short wavelength. There is also the older religious argument of "ensoulment." The idea is some completely non-physical entity such as a soul or spirit in humans interacts with the mater of our brains. Some are strong in faith but we're still short in evidence. No one knows for sure. Perhaps some things currently on the fringes of science may turn out to be true, such as: ESP, telepathy, out-of-body-experiences and related things? Maybe all ghost sightings, for another example, are not simply hallucinations or illusions? People have claimed to see things such as ghostly ships with crews and other scenes with marching soldiers etc. If these people are all hallucinating then why do they see the same things? People who suffer from hallucinations such as some in psychiatric hospitals do not all have the same visions. However people have not only seen the same ghosts but at different times and sometimes in different locations. It has also been determined that everyone who makes such claims isn't mentally ill, on drugs or in collusion. Maybe there are holographic-like copies of former things made up of unknown particles that occasionally and temporarily appear in the environment. If so, people at least at times are really seeing something. What if telepathy in some individuals really occurs? People report they have occasionally had an inner hearing-like experience of the thoughts of others. If it is so, it would mean that some unknown radiation of the sort I speculated about is emitted by brains/minds and some others are at times receiving and deciphering it. It may also mean our minds, thoughts etc. actually consist of these unknown particle/waves. In any case very few particle physicists, if any, think the current Standard Model particle list is complete. If such things exist outside of brains, maybe we really do survive the death of the body. However, we also can't claim to know all the answers especially about any so-called life-after-death schemes. Among the problems are the teachings of different mystics and/or founders of religions about after-life scenarios contradict. It means they aren't all reading off the same page and at least some of their non-provable revelations can't be true. We can all still believe whatever we like but beliefs lead to conclusions that aren't proven. To believe something is a creative act. One must fill in the blanks between things known and unknown but this doesn't make it objectively true. I believe things too but I view a belief as a working model, that's subject to change due to new information and/or perspectives. As evidence compiles, the case becomes sounder and things eventually become provable. There comes a point when there isn't a need to "believe" since one simply "knows." So many balls, for example, have been dropped that we don't have to believe things fall at a known rate of acceleration independent of their mass. Of course there are different bars of proof such as "beyond a reasonable doubt" or based on "the preponderance of the evidence." In science both, yes even the later, are acceptable. Scientists also continue to search for better cases since all of the data is rarely available and prevailing theories are thought of as the best current approximations. How great is that! I think reason and observation should usually lead our searches but there are times to pay attention to intuition and emotion. Intuitions can produce a "feeling" of what is true but this alone doesn't "prove" it. However these can create leads or directions for further study. Care is required since if intuition suggests something that goes against established facts then it can't be completely right. On the-other-hand one shouldn't always out-of-hand simply accept commonly held assumptions. The "mystic within me" intuits more answers can be found. However the "scientist within me" always wants to criticize conclusions and raise the bar of physical explanations as high as it can go. The mystic and the scientist within can at times conflict. However there are times when both co-operate. When intuition assists reason/observation it can lead to breakthroughs! James Clerk Maxwell (known for his 19th century mathematical formulation of the electromagnetic force) and Albert Einstein (known for his 20th century Special and General Theories of Relativity) are examples of theorists who were greatly assisted by their intuition. I think listening to it makes the exploration of "all that is" (ATI) far more exciting! & choose Dr. Michael Doser's video. The galaxies that are moving towards us create the opposite effect of the spectral lines shifting towards the blue end of the spectrum. This is called blue-shifted.